Finding other things in the Solar System similar to Pluto has really bothered some astronomers, apparently. Some want to demote Pluto from its planethood while others prefer to add a bunch more planets. What is a planet anyway, they're asking? What is it that gives an object that essential quality of planetariness?? So the International Astronomical Union has hammered together a definition that essentially says, "A planet is a round thing that goes around the Sun but doesn't go around another planet." They're voting on this August 24th in Prague. A definition like this gives us a couple more planets: An asteroid, a round thing recently found out beyond Pluto, and, weirdly enough, Pluto's moon. Whether something is a moon or a planet depends on what your definition of "around" is, you see. 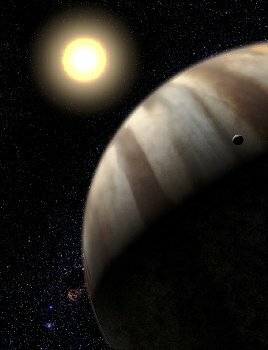 Some astronomers say you could end up with 50 or 60 planets eventually if you don't watch out. We actually went through this several centuries ago when scientists started finding the asteroids and gave some of them cool names like Ceres and Pallas. Eventually, though, we decided they're no good as planets. Personally, my definition of a planet is, "Anything we feel like calling a planet."